Hayes of the 23rd New York Light Artillery. Written in ink, letter is undated, though content indicates it was penned in April 1863. Excerpt:''Those shells ware got at different places the most of the large ones ware picked up on the Cape Lookout some of them ware gathered in the Boque Sound the large pearl shell I got when I was on a march it was taken out of the Reble Senator Cobbs House it is worth considerableThose cards I got from a house when the Battle of Thompsons Bridge also the snuff box. The bracelet took from another house whare we passed on our tramp. The pocket I got with the pearl shell. Probely the Tompkins Girls are too bashfull to own up that they corispond with a gentleman. I have such a number of letters from themWe expect to go out again soonbut dont worry about us we can take care of our selves we dont have to go into very close action because our pieces can shoot a good ways with out getting close and the Rebs have not got guns one out of ten that will shoot as far as ours. Well it was my turn to go on guard to night but as I had a little cold I got excusedReport in Newbern is that the Rebs have taken our men at Little Washington and that our troops have finaly succeeding in running the blockade whare we ware and report is that Charleston is taken and then not taken but our men are defeated thareAlbert Bliss's body will probably be home before you get this'' Hayes mustered into service on 29 August 1862 and was mustered out on 14 July 1865 at Fort Porter, Buffalo, New York. The 23rd New York saw action at Kinston, White Hall and Goldsboro. Letter measures 7.75'' x 10''. Light soiling at folds and overall fading to ink, otherwise very good condition. AUTHENTICITY LIFETIME GUARANTEE All autographs are guaranteed authentic for the life of the autograph. 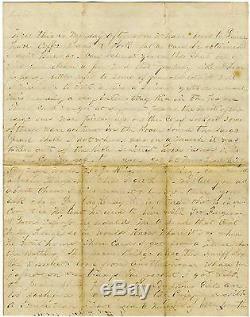 The item "Civil War Letter 23rd New York Light Artillery 1863" is in sale since Tuesday, April 28, 2009. This item is in the category "Collectibles\Autographs\Other Collectible Autographs".